Shalita Williams, recalls some early brushes with the law. “I started coming in contact with the law when I was 14, when I was caught stealing at Woolworth’s. I wanted to see if I could I get away it. I wasn’t a good thief; my stealing career was over,” Williams said, looking back over the path that led her to juvenile incarceration, giving birth while in shackles at 16, several stints at the Santa Rita Jail, and now preparing to graduate from UC Berkeley with a double major in Spanish and sociology, and plans to pursue a Ph.D. program. Williams’ story is that of the second generation of the devastating crack epidemic that tore through Oakland and other cities in the ‘80s. Earlier, her family had lived in comfortable accommodations in East Oakland. Her father was a welder. “We had nice stuff,” she recalled. “But the crack epidemic tore my family apart.” Both parents became addicted; her mother sold drugs. Her uncle’s wife was murdered execution style, because she had stolen drugs. At home, Williams reports that she was verbally and physically abused by her parents, both of whom are now deceased. She became pregnant at 15 and gave birth at 16. She had started on an odyssey of petty theft, selling drugs, being in relationships with abusive men and addiction. She was arrested when she was four months pregnant. She realized she wanted to stop selling drugs and make a better life for herself and her children. Her sentence was reduced after she agreed to participate in a drug rehabilitation program. But that was after Williams had her baby in jail, shackled to the delivery table. “ I was baffled – I was not running nowhere,” she said, recalling that one ankle and one wrist were shackled to the delivery table. “This was a turning point in my life that humiliated me to the point that I never wanted to go to jail again, but my addiction brought me back for one last time.” She said she still feels the humiliation of that experience. Typical of young people trying to turn their lives around, her decision didn’t hold. She had a difficult time finding a job, she was depressed, using drugs again and in another abusive relationship. She was arrested for child neglect after leaving her children at her mother’s house which was judged unfit for children. And she was in possession of drugs at the time of her arrest. Finally, Williams rounded the bend. “I hit a spiritual wall. I knew my life had to change.” She returned to school, studying business administration. 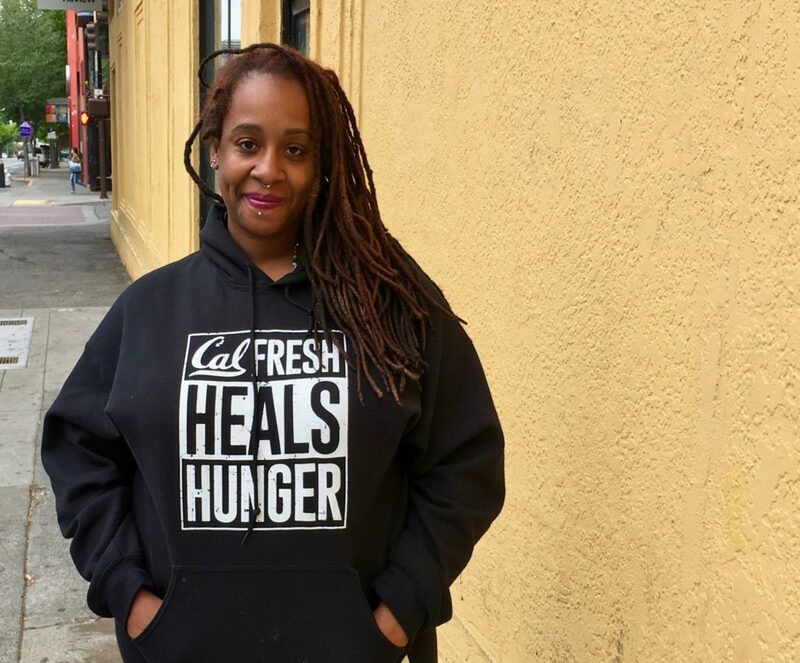 She became an excellent student, graduated from Merritt College and transferred to UC Berkeley, where she became involved with the Underground Scholar’s Initiative (USI). Her boyfriend, whom she met at a Narcotics Anonymous meeting, told her about USI. The USI program, which calls itself a prison- to- school pipeline, provides academic and other support for students who have been incarcerated. At first she resisted, saying, “No, I’m going to focus on academics.“ But she started going to the meetings and even tutoring other USI members. “They’re like my extended family. I’ve become opinionated but that’s what they like about me. They say I’m funny. I can be really silly.” Williams is continuing her studies to earn her B.A. in sociology and Spanish in 2018. She credits USI with providing her with the necessary resources, including networking and assistance in getting into her research program, partly possible through a “Live Your Dreams” Soroptimist Award. Her story of survival, set-backs and eventual lasting change makes her point. This was a very phenomenal inspiration story. The story of a beautiful soul.. a diamond in the rough! Shine bright beautiful black queen you deserve it. That was the saddest story I’ve ever read but with a triumphant ending!